(Phys.org) —A team of scientists have unmasked the intricacies of how sharks hunt prey—from the first whiff to the final chomp —in a new study about shark senses that was supported by the National Science Foundation and published in the peer-reviewed journal PLOS ONE. 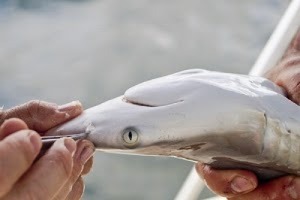 The study, led by scientists from the University of South Florida, Mote Marine Laboratory and Boston University, is the first to show how vision, touch, smell and other senses combine to guide a detailed series of animal behaviors from start to finish. Results show that sharks with different lifestyles may favor different senses, and they can sometimes switch when their preferred senses are blocked. That's hopeful news for sharks trying to find food in changing and sometimes degraded environments. "This is undoubtedly the most comprehensive multi-sensory study on any shark, skate or ray," said Philip Motta, a USF biology professor and internationally-recognized shark expert who co-authored this study.